I’ve been designing a wide range of low wedding centerpieces for brides with a vintage wedding theme. 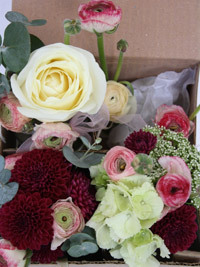 Here is one idea to get you started, this low centrepiece is easy to create and the materials can be quite inexpensive. 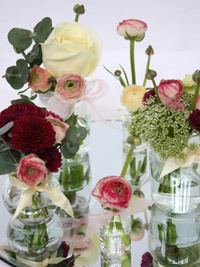 I’ve chosen to arrange the wedding flower posies in jam jars to fit with the vintage wedding theme. I’ve also chosen old-fashioned flowers such as hydrangeas, ranunculus and roses to give the look of a wild English country garden. To create this low wedding centrepiece simply follow my step-by-step instructions detailed in the vintage birdcage centerpiece tutorial and simply leave out the birdcage. The great thing about these wedding centrepieces is you can create everything the day before as all your flower posies will be in water. Then all you need to do is pack them into boxes so they don’t fall over and polish your mirrors. 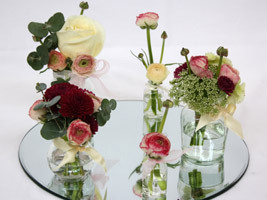 On the morning of your wedding you or one of your friends will simply be able to arrange them on the tables . These cute little flower posies will make lovely gifts for the guests on the table to take home at the end of the evening. "Absolutely beautiful. All our guests made wonderful comments. They looked like something out of a magazine."